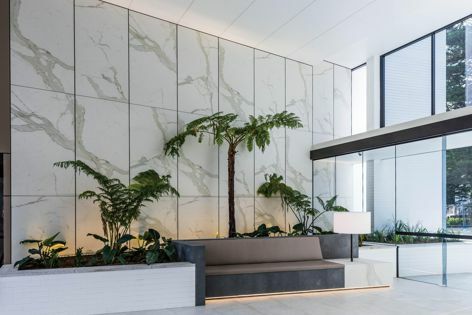 Maximum’s matt Calacatta panels were used at the Moreton Bondi by Smart Design Studio and Mirvac. Photography: Willem Rethmeier. Maximum Australia’s Active 2.0 is a photocatalytic coating that uses leading-edge technology to remove toxic nitrogen oxides from the air and reduce concentrations of dangerous volatile organic compounds (VOCs). Developed for Maximum porcelain panels and made in Italy, Active 2.0 also has self-cleaning and anti-odour properties and prevents the spreading of bacteria.